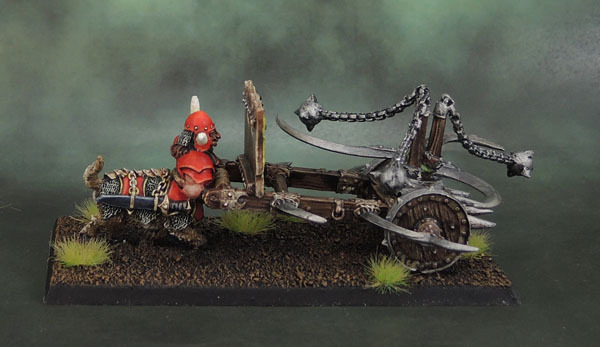 Chaos Dwarf Boar Centaur War Machines: The Whirlwind! | Azazel's Bitz Box. 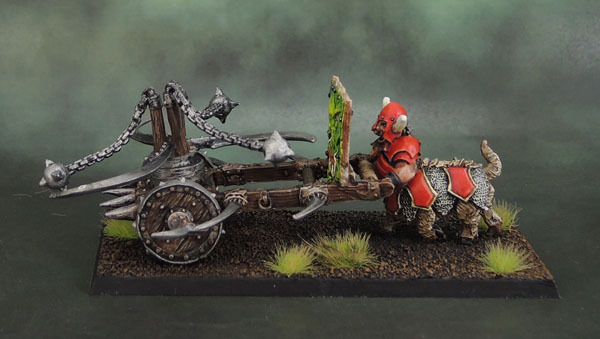 Chaos Dwarf Boar Centaur War Machines: The Whirlwind! Before there were Bull Centaurs, there were Boar Centaurs! Now I’ve finally caught up on January’s posts, I can finally start on February’s. So …yeah, I finished the “February Challenge” to complete a neglected model on the 1st of February, when I motivated myself to get this guy off the shelf and finally complete him. Of course, with a challenge like “finish a neglected mini”, it’s the sort of thing that I’m naturally going to get done a whole lot of times, since I’ve got WAY too many neglected minis and intend to continue what I’ve been doing for quite awhile and concentrate a lot of my effort on finishing the very same, rather than starting too many new figures. I really put this challenge together after considering a comment from IRO, who asked if I’d be setting up another challenge after Painting Decembuary. Initially I didn’t want to because when there are too many challenges it can become tedious, but then decided to set up one that’s easily achievable, not only by my own self, but by others. This guy was released back in September 1991, and I got both the Tenderiser (still completely unpainted) and this model, the Whirlwind (predating the Space Marine armoured vehicle). I never got the Juggernaut, which is a kind of Siege Tower thing. It was too much for my finances at the time. The model was originally painted very similarly to the “official” one, but with a slightly more Khorne-oriented paint scheme, much of which still shows through today. Of course, over the last 35 years or so, the figure got knocked about, most of the “lawnmower” (as we called it) got broken up, and well, you get the idea. Last year or the year before, I gave him a new base, and did a little bit of touch-up, before getting a bit stuck and a lot distracted. So since then, it’s been sitting around, in the way, on the shelf, on the table, move it here, move it there until this painting challenge did finally motivate me to just finish the bloody thing already. In that sense, I actually have IRO to thank for finally getting this thing completed. When I eventually focus on painting my Chaos Dwarves, I’ll fit this guy into the army for whatever system I’m using. Until then, he’s mostly a display piece – but most importantly, he’s finally done! 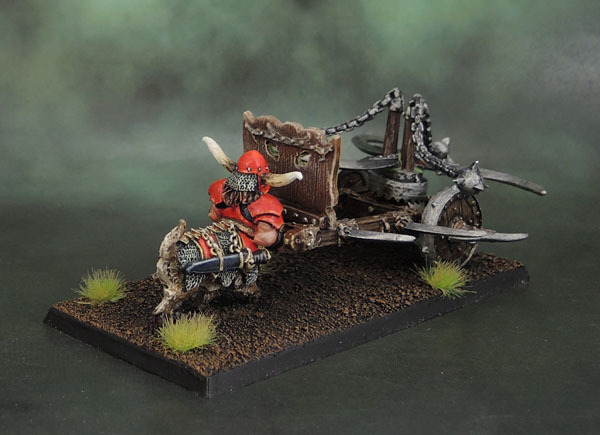 This entry was posted in Chaos Dwarf Army, Oldhammer, Realm of Chaos, Warhammer Fantasy - 9th Age and tagged Chaos Dwarf Boar Centaur, Chaos Dwarfs, Chaos Dwarves, Oldhammer, Warhammer, WHFB. Bookmark the permalink. 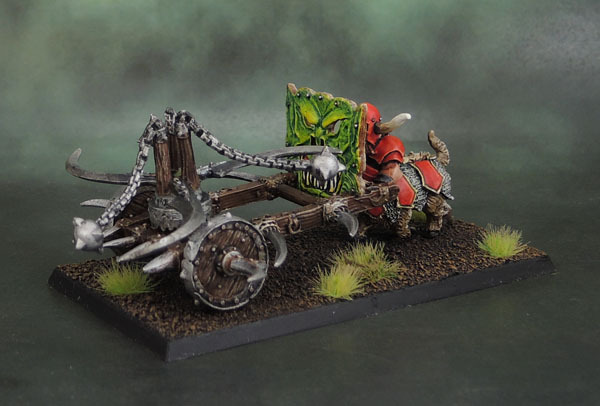 That is such an amazing looking siege weapon – in fact…it’s not even really a siege weapon. That’s more just a weapon. Either way, it’s amazing. I mean, I would love to know the thought process behind the boar centaur/orc who designed it – “yeah, just in case the giant scythes don’t destroy our enemies, let’s make sure we smack them in the face with morning stars”. Yep, it’s a mental design – though a real joy of it is that the cogs, gears and other parts fit together in a manner that (theoretically) might actually work! Amazing detail to the mini then. I can actually imagine something like that being used as a weapon in some B Movie Zombie flick. I love the fact that the eyes in the giant face are holes to allow the boar centaur to look through. Yeah, it’s a really well thought out model, despite being so over the top! Blood Bowl needs one of those! 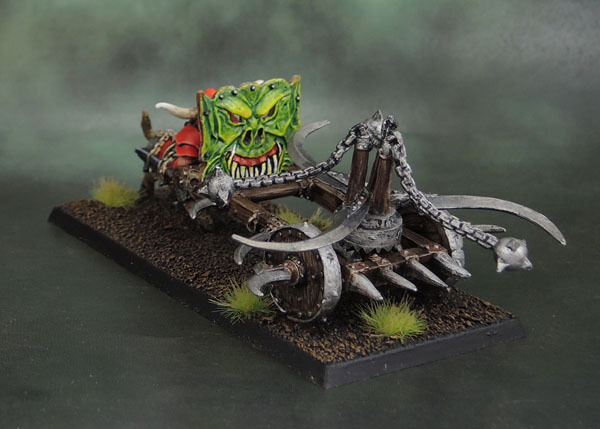 I recall someone mentioning a ‘Goblin Death Roller’ sort of device. It might have been in an old White Dwarf article. 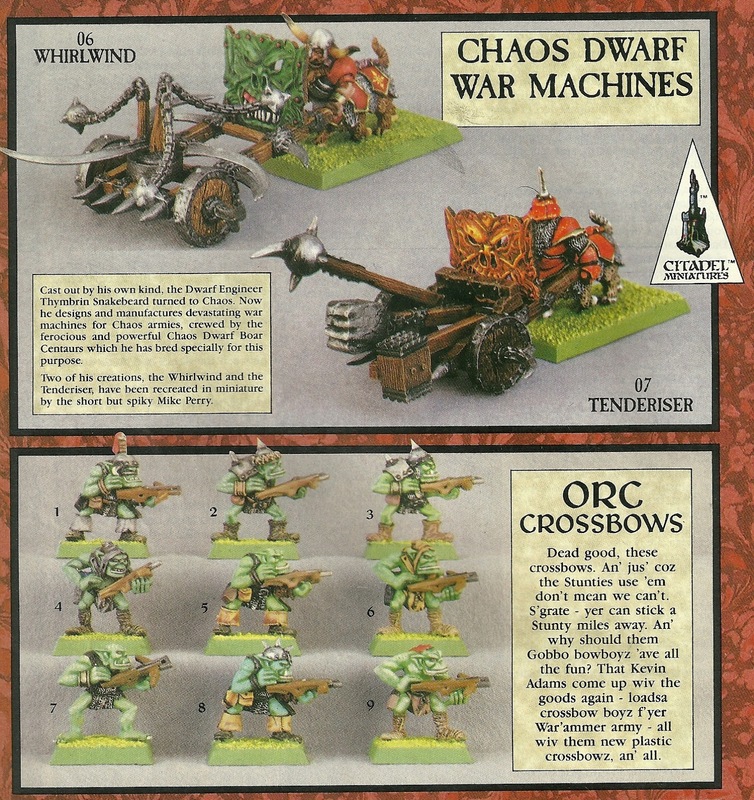 Chaos Dwarf teams are pretty powerful already, but that looks so cool that I would definitely pick one up. Sounds like maybe something from the Citadel Journal, or the A5-format journal-like mags that they put out for Blood Bowl? I need to go back and finally finish my Chaos Dwarf team. I’d planned to when BB got re-released a few years ago, but I got distracted. I mean, the Dwarfs are all done, it’s just the Hobgobs I have left to finish painting..
Oh yea, I forget there was a dedicated Blood Bowl mag too. All of that happened before I got into Blood Bowl. I was too busy playing D&D, HeroQuest games, and a million other rpgs at the time. I didn’t even know that this model even existed! It’s pretty old-school, and from the time where it seems that their sculptors had a lot of freedom. Within a couple of years, Chaos Dwarves were redesigned with Big Hats, and then shuffled off into the corner and mostly forgotten, so their time in production was relatively short. It weighs just over 100g, so about the same as those old-timey metal chariots and such that had metal beasts pulling them. Good work. I love the face on the shield. I can see this is a genre I might have to get into at some point. Thanks! Fantasy in general, Warhammer in particular, or…? Good question. It’s not an area I know much about but for what you and IRO do I wouldn’t have a clue. Just nice to do something different and perhaps use some paint colours that don’t come out very often! That’s always a good way to do things. Find some figures that tickle your fancy and just go for it without worrying about building armies in a new genre. 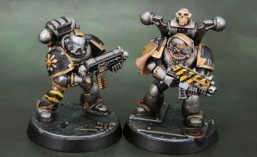 You could go for a small skirmish force type thing if you want to paint/collect a set of models, or just a bunch of individuals. If you ever have any questions, feel free to hit me up! This is great Az Man. Really bloody cool. Are you doing the FEMbruary challenge put forward by Alex? Thanks IRO. I’ve been working on the Dark Elf Sorceress a little this afternoon. Haven’t touched the Escher yet, though. Thank you Alex. 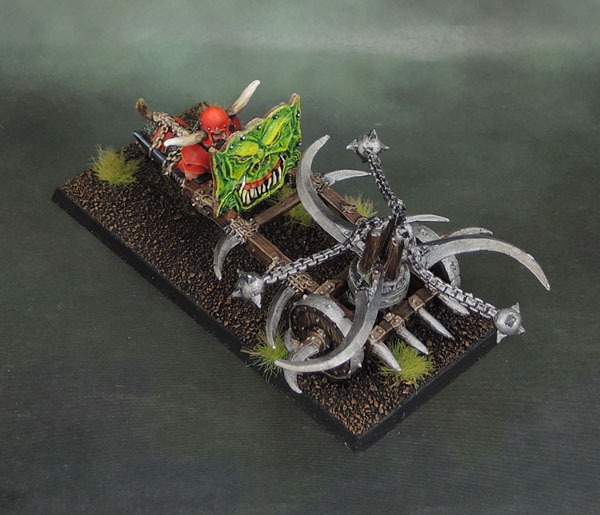 I’ll have to do the Tenderiser as well at some stage, though I might wait until I’m actually working on fantasy armies properly again and do it as part of the Chaos Dwarfs. That is really great- very old school, very cool. Thanks Pete. 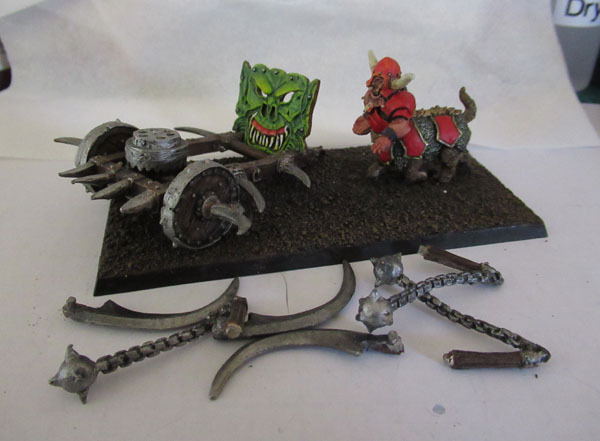 One day I’ll get onto painting the rest of my old-school Chaos Dwarves. Maybe in 2019? Ha! Completing a challenge on the first day! I like the face on the gun shield. It adds colour and whimsy to the model. Pingback: Squaduary 2018 Challenge: Part 1 | Azazel's Bitz Box. It does look good, no doubt about it! I have a vision in my head of IRO in his garage with his welding gear doing a full size conversion on his lawnmower now! Trouble is, he’d do a damn good job! Either that, or he’d end up a horrible mess after trying to use it! It’d certainly be a spectacle either way! Really clean and crisp job on this classic. Best one I’ve seen! I do my best not to chew on them. 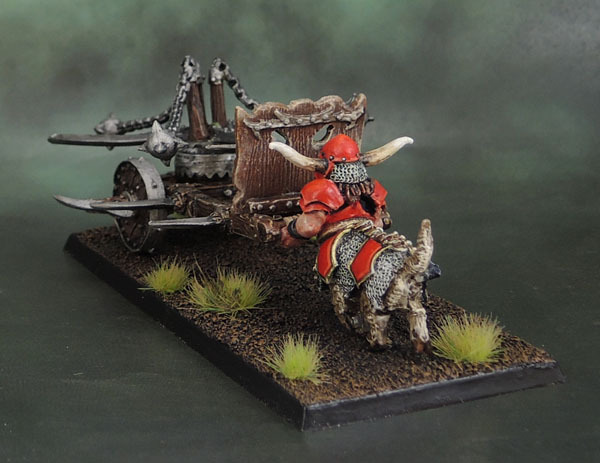 Boar centaurs is a very cool idea. Yeah, they morphed into Bull Centaurs which are fine as part of Warhammer getting bigger and betterer, but the Boars definitely have a certain charm to them. I’m also (obviously) a big fan of metal models. These kids today who hate metal just weird me out, to be honest. I mean, I’m not hugely excited by assembling multipart metal models, so I get that, but hating a model based only on the material is just nuts! I get the impression that self-cleaning isn’t high on his priority list somehow! Neat paintjob, as usual. Crazy old-school model. Almost forgot about it. Thanks for bringing this out!